Twenty One Pilots are back with new music and a massive world tour, which they’ll be bringing to the UK & Ireland in February/March 2019. The album will be the official follow-up to the Grammy Award-winners 2015 LP ‘Blurryface’, which entered the Billboard 200 at No.1 and went on to sell an impressive 6.5 million copies worldwide. The album also achieved a major milestone when it became the first album in which every individual song on the album is certified Gold, Platinum or multi-Platinum by the RIAA. 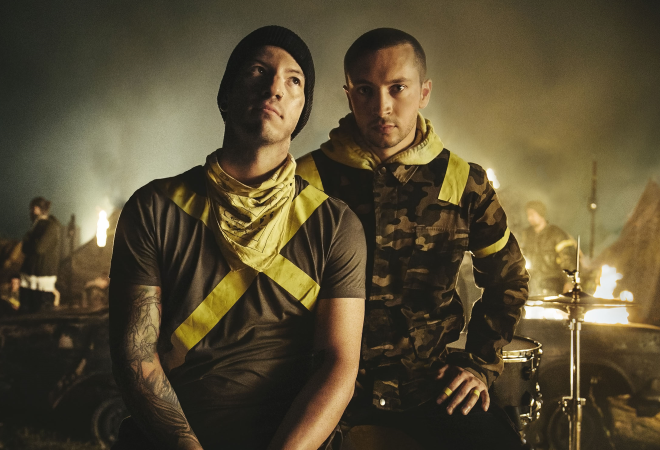 Twenty One Pilots have received various major awards and nominations including a Grammy, seven Billboard Music Awards and two MTV Europe Music Awards – to name just a few! The official music video for ‘Stressed Out’ has accumulated close to 1.4 billion YouTube views. The track ‘Heathens’ featured on the Atlantic Records Suicide Squad album soundtrack. ‘Heathens’ reached No.1 on the iTunes chart in over 50 countries. Their ‘Blurryface’ album earned gold, platinum and multi-platinum certifications in various countries including Australia, Austria, Belgium, Canada, Denmark, France, Germany, Italy, New Zealand, Norway, Poland, Switzerland and the UK.